House Intelligence Chairman Mike Rogers Won't Seek Re-Election : The Two-Way The Republican congressman from Michigan is going to launch a talk show on the Cumulus radio network. He's been one of the GOP's leading voices on issues related to national security. Rep. Mike Rogers, R-Mich., during an appearance last year on CBS News' Face the Nation. The chairman of the House Intelligence Committee says he won't seek re-election in November. 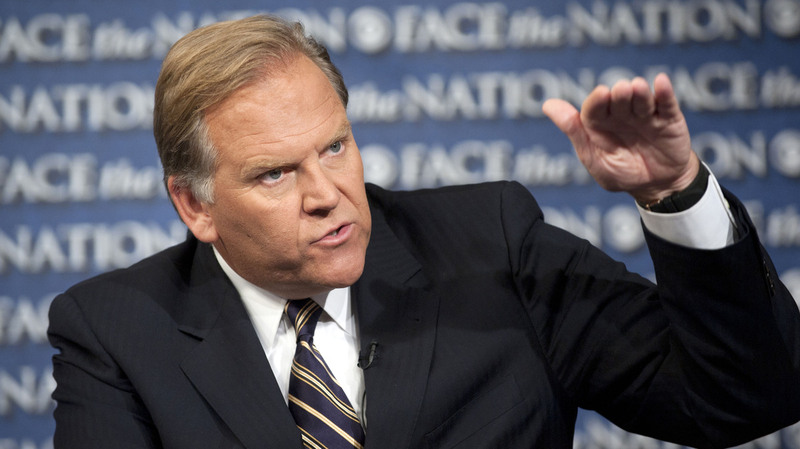 House Intelligence Committee Chairman Mike Rogers, R-Mich., confirmed Friday that he will not seek re-election in November and is going to host a talk show on the Cumulus radio network starting next year. Rogers made the announcement, which was the subject of rumors Thursday night, on WJR radio, a Detroit news/talk station that is one of the Cumulus network's 525 stations in 110 cities across the nation. The congressman, now serving his seventh term, has been a frequent face on Sunday-morning talk shows in recent years and a go-to source for comment on national security issues. According to the Detroit Free Press, the 50-year-old Rogers said Friday that his radio show will focus on conservative and national security issues. He made the case that the conservative voice "is missing" in the news media. During his career in Congress, Rogers has been viewed as a strong supporter of House Speaker John Boehner, R-Ohio. Boehner picked Rogers to be the Intelligence Committee's chairman in 2010 over Rep. Mac Thornberry of Texas, who remains the committee's second-ranking Republican. "Rogers joined the FBI in 1989 as a special agent in the Chicago office, focusing on public corruption and organized crime, among other issues. In 1995, he was elected to the Michigan Senate, rising to majority floor leader in 1999. "In 2000, Rogers won election to Congress. His southeastern Michigan district voted for Republican Mitt Romney in the 2012 presidential race following redistricting, but Barack Obama carried it in 2008. "Rogers has been a frequent Obama critic during many appearances on Sunday morning talk shows, although he was briefly floated as a potential CIA director nominee following President Obama's 2012 reelection victory. "He has been a harsh critic of former NSA contractor Edward Snowden, suggesting — without offering additional proof — that Snowden was working with foreign intelligence agencies."